In the 2017 State of the CF Union survey report, we have detailed breakdowns of tools and techniques used by the top CFML developers around the world. This time we had 472 responses to the survey, which is slightly lower than last year. Before we begin with the results, we’d like to thank everyone who participated and responded to this year’s survey. And a special thanks to Brad Wood who helped me edit the survey questions and reviewed the results with me. Brad pointed out that it's not just CFML developers and enthusiasts that read through all of the survey results, and that even Adobe pays attention to the survey as well, so it's good to know that the comments and the results on here are definitely being seen by even the largest players in the CF space. Everyone's welcome to read the results. They're at the TeraTech survey page and you can all see all the results in as much detail as you care to. Let's just have a look at this. 14. What CF features do you use for code reuse? 15. What do you use for source code control? 16. What tools/IDEs do you use ? 18. How many years have you used CFML? 19. How many years have you used OO? 21. How many CF developers at your organization? 22. How many total employees at your organization? 24. Which conferences will/did you attend this year? What version of CFML Engine do you use? The most popular engine is still CF 11, which was true last year. It's nice to see the ColdFusion 9 members finally shrinking. It was a version that a lot of people got stuck at for many years, so we feel better about dropping support for that in the ColdBox framework, ColdBox 5, for instance, coming up. CF 11 is still very much on top. 2016 is growing, but it's even behind CF 10 at this point, which is very interesting to see. Also, there's some interesting numbers here too- Lucee 5 is actually more popular among the survey takers than CF 10 or CF 2016. 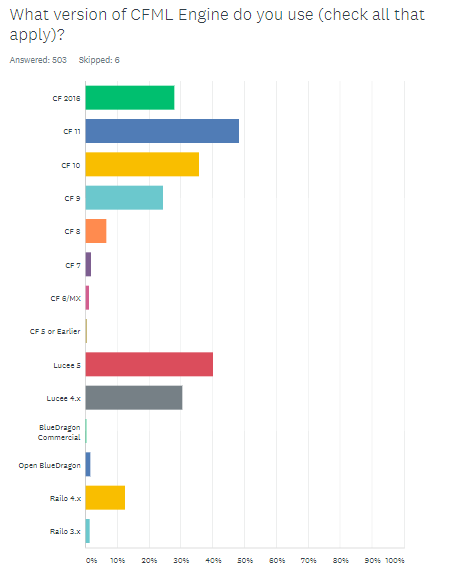 It's important to note that this is only out of the people that take the survey, so I do think the people more active in the community that are likely to see the survey are more likely to be using Lucee, but it is very heartening to see a very solid uptake, especially even just in Lucee 5. Of course, now that it's been a year or so you can see the Railo shrinking into oblivion since it's essentially unsupported at this point. It's interesting to note as well, thinking about these graphs, which versions are still supported. Lucee 4 has support only for security fixes, but it's not seeing enhancements, that's all going to Lucee 5. And, it seems that CF 9 went end of life, about two years ago. CF 10 I think is maybe just a very short period of time away, so very soon there's going to be quite a chunk of Adobe people that are outside of the support window, which is a little scary to think about. That means not just the support, but also no more security hot fixes is like driving a car with no brakes and praying that nothing comes on the road that you need to stop for. 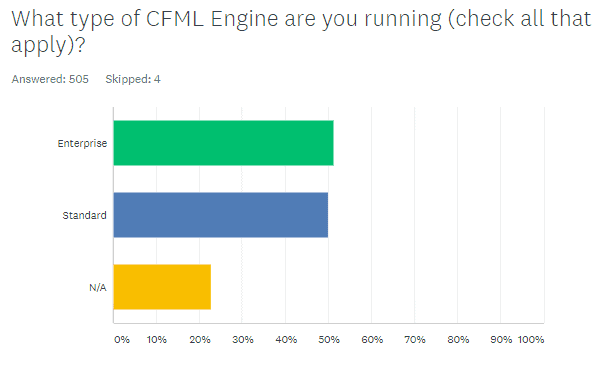 What type of CFML Engine are you running? There's not much to say about Enterprise versus Standards, quite a lot of people using Enterprise. They are pretty neck and neck. The assumption is that the non-applicables are probably mostly the Lucee user base, since there's no differentiation there. The reason is that you get all the features in the one version. It's either free in one version or free in the other versions. They probably decided to just go with one. Interesting note is that back in the early Railo days, there actually used to be a premium version of Railo that had additional features, but that's no longer the case with Lucee. 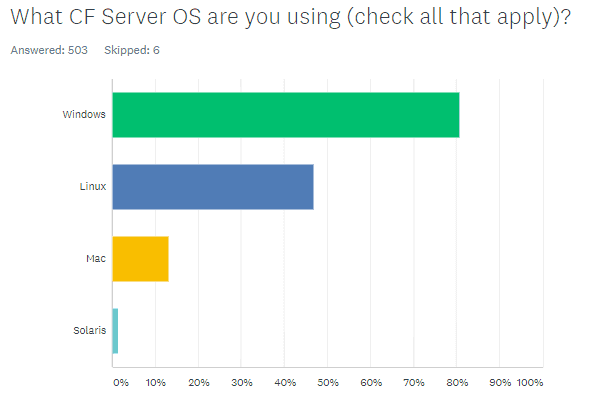 We can see that most people are using Windows but there's a big chunk of people using Linux or something similar. There's still some Unix flavors out there. The large Windows use is something that's sort of unique to the ColdFusion and .NET environments probably. If you were to do a similar poll looking at PHP or some of the other popular languages, you'd see an inverse of a lot more Linux users. What's interesting though is there is a solid chunk of Mac people, and this is for the server OS. This means people are hosting their servers on Macs, and that's actually a decent chunk. Sometimes ColdFusion doesn't work exactly the same on Mac, but maybe they're running a staging server or development server, and they develop on Mac and they're hosting it on a Mac. Follow this link to read the full State of The CF Union 2017 Analysis part 1.